On a recent corner-to-corner drive across the state of Wyoming, I paralleled the Mormon Trail for about 200 miles: from where the trail intersects I-25 (about 80 miles north of Cheyenne), through Casper (site of the first Mormon ferry), along Wyoming 220 past Independence Rock, Devil’s Gate, and Martin’s Cove, then up US 287 past Split Rock to the Sixth Crossing of the Sweetwater River. I’ve never been much for pioneer tales, but I enjoyed taking in the landscape that was the common experience of the first twenty thousand Mormons who made the overland trek to Utah. An excellent site worth your $6 entrance fee is the National Historic Trails Interpretive Center (NHTIC) in Casper. It offers exhibits and information about the Oregon, California, and Mormon Trails, without the gospel message and missionary escorts found at LDS historic sites. The NHTIC website offers a virtual tour with short blurbs on the major landmarks along the trail. 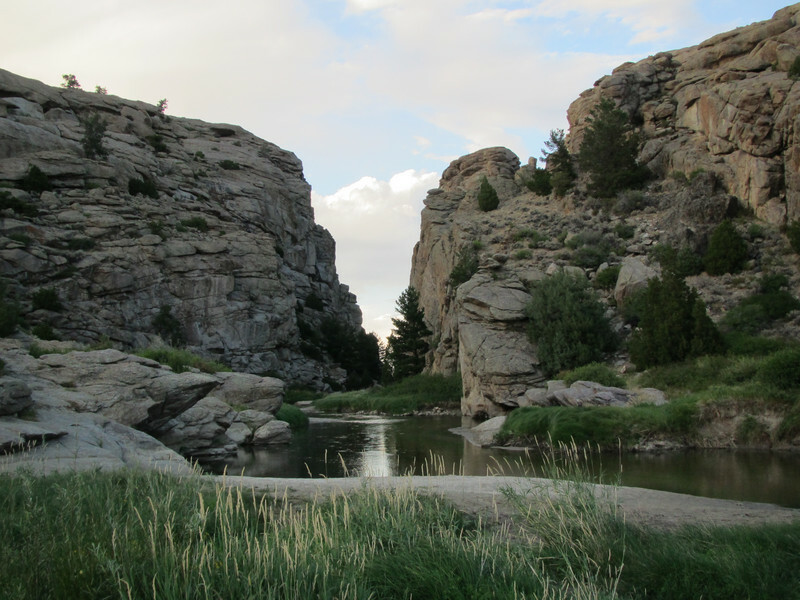 The defining feature of the Wyoming stretch of the trails (which merged into a single busy trail for most of the passage across what is now Wyoming) is mountains. From the first view of Laramie Peak all the way to South Pass and beyond, stark rocky ridges and peaks dominate the traveler’s view of the skyline north and south. Today, zooming down the highway, a given landscape feature like Devil’s Gate might be in view for ten or twenty minutes; if you were trudging along the trail on foot or by wagon, these landmarks loomed ahead for days at a time, never to be forgotten. 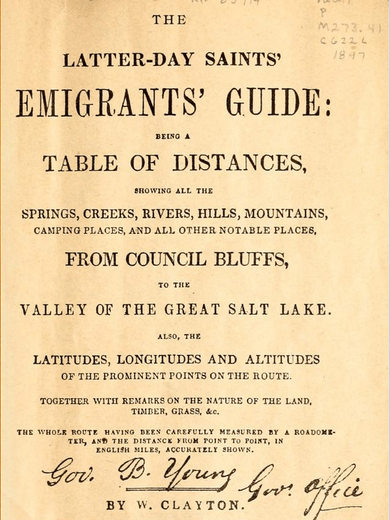 [Clayton] later prepared and published The Latter-day Saints’ Emigrants’ Guide, a meticulous description of the route from Winter Quarters to Salt Lake City, with suggestions for camping places. Using his odometer, the guide had the most accurate distances of the day. It was a valuable guide for Mormon migrants, but was also used by pioneers bound for the Oregon and California territories. Concern to help subsequent Mormon emigrants was a unique feature of the Mormon migration. Mormons on the trail would invest time and effort improving the trail by clearing rocks and debris, establish permanently staffed ferry stations at tough river crossings, and send detachments back along the trail with scouts and supplies to assist subsequent migrating companies. Clayton’s Emigrants’ Guide was just one example of this strategic approach to migration. Past Casper along Wyoming 220, three prominent sites occur within 10 miles of each other. Independence Rock abuts the highway. Shame on you, hardy traveler, if you don’t take an hour to scramble up to the top and explore the hundreds of names and dates scratched into the rock. The earliest I found was from 1859; there are earlier ones, of course, including a “J. Smith” from about 1850 (one of Joseph’s relatives?). Six miles up the pike is Devil’s Gate, a spectacular gorge cut through a rocky ridge by the Sweetwater, visible from twenty miles away. Just west of Devil’s Gate is a visitor’s center and handcart station run the by the Church. Martin’s Cove is reached from there by a short two-mile trail. The NHTIC has a handcart exhibit and film which covers the facts without the obligatory piety one finds in LDS accounts. Information there helps put the 1856 tragedy of the Martin and Willie handcart companies into perspective. Crossing a thousand miles of open country under any circumstance during this era was a challenging undertaking with many potential dangers and pitfalls. The death rate on the California Trail is estimated at one in seventeen persons or about six percent. That works out to about ten graves per mile. The 1856 tragedy resulted from a combination of bad judgment (a late departure with marginal equipment) and bad luck (an early winter). But most accidents and fatalities on the trail resulted from a combination of bad judgment and bad luck (Oops, I shouldn’t have turned over that rock and got bit by a rattlesnake; stupid me, I shouldn’t have tried to drive my wagon across that deep ford; etc.). The mortality rates for the 22-year Mormon overland migration were lower than rates on the Oregon and California Trails, partly because the trip to the Salt Lake Valley was hundreds of miles shorter than to California or Oregon, but also because the Mormon companies were better organized, had better leadership, and in a pinch could obtain assistance from other Mormon groups on the trail or from relief sent back from Salt Lake. The handcart tragedy was a blip; it was not a manifestation of misjudgment unique to the Mormons or of an LDS penchant for risk-taking. Finally, about 70 miles past Devil’s Gate and 30 miles east of South Pass, there is another LDS handcart station at the Sixth Crossing of the Sweetwater, in the middle of nowhere right on US 287. An impressive collection of RVs hosts a small village of LDS missionary couples that run the site, which, like the Martin’s Cove site, hosts pioneer camping activities by LDS youth groups. Can you smell those buffalo burgers sizzling on the grill? No cell phones allowed. It’s nice the next generation is getting a taste of life on the trail. I originally posted this here at T&S in July 2009. Pioneer Day seems like the right occasion to do a re-post, with images added and a few typos corrected. Thanks, Dave. I’ve really got to take a trip across Wyoming some time.